Heroes of the Storm's "Silence Penalty" will gag players who don't play nice, restricting the vast majority of their chat options. For some reason, trolls are attracted to MOBAs like moths to a flame. Perhaps it's the being forced to play nice with four strangers for upwards of 30 minutes, perhaps it's the fact that when the enemy team snowballs in a MOBA, it is extremely difficult to recover, or perhaps it's just because trolls love MOBAs. 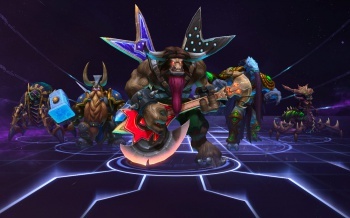 It's something games like League of Legends have had to invent creative solutions for, and now it looks like Blizzard's MOBA Heroes of the Storm has come up with it's own way of dealing with trolls. It's rather simple, really. A troll's power comes from his toxic words, so what's the easiest way to deal with that? You silence him. As well as a slew of new reporting options, categories, and guidelines, Blizzard has revealed that the "Silence Penalty" will be applied to players who break the rules. If you are reported enough, you will be "squelched" for 24 hours, which will block you from communicating with any player who is not on your friends list (including private messages). Every additional infraction thereafter will double the silenced period. For those of you looking over the reporting catagories, seeing stuff like "AFK" and "intentional feeding" and worrying about some of HoTS more, unique heroes (IE: Abathur and Murky) getting reported unfairly, Blizzard says that it will be paying special attention to reports from these heroes, and what's more, will be looking into investigating players who are found to frequently dish out trivial or false reports. It's kind of sad that pretty much every MOBA these days has to have some kind of system in place to curb trolls, but I must admit that HoTS' solution is quite unobtrusive.